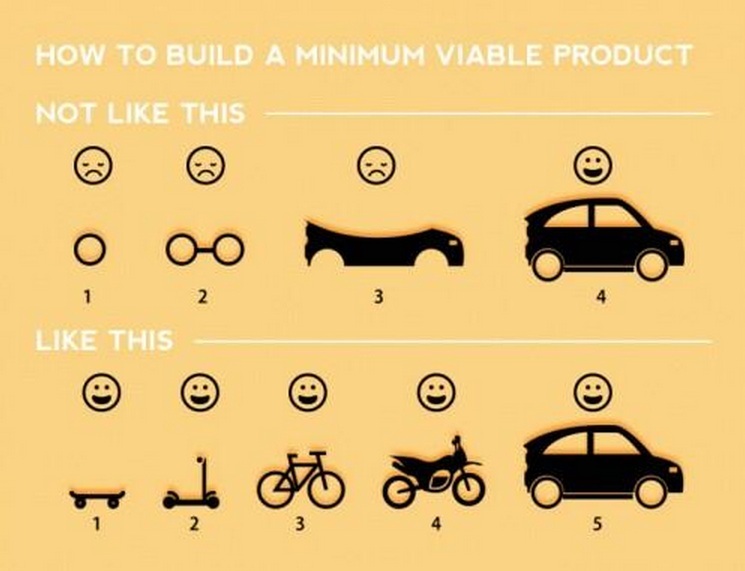 There isn’t too many things more sacred than Minimum Viable Product in the Agile circles. Maybe Planning Poker, Automated Testing, and Continuous Integration. But usually Minimum Viable Product is also right up there. What if I told you that focusing on Minimum Viable Product is sometimes the wrong thing to do? Would I be branded a heretic? Well it is – sometimes. I sometimes find that we in the Agile community are falling into the old traps that haunted the traditional Software Development Professional – the fact that we know what is best for the client. I see comments like we shouldn’t create any documents or create any estimates because they are waste. Usually these positions are written from the point of view of the Software Development team. But we as developers may define value and waste differently than our clients. We need to understand the context of the project we are in and the situation the client is in and apply our processes accordingly. For some clients not creating documents may be a waste as they will need to create them for regulatory purposes and it may take them longer to create them after. (In addition to being more error-prone) For some clients, estimates may provide them great value in their forecasting and budgeting process. So while we may think that creating estimates in wasteful, the clients may not share the same view. Ultimately, their viewpoint is the one that matters if we want to be client focused and remain in the service industry. Our job as Software Development professionals is to provide our expert opinion and highlights the impacts of the decision to the client. If we can’t convince the client of the value of our position, then our position could not have been a strong one to start with. Our job as Software Development Professionals to to provide all the information to the clients so they can make the most well-informed decision possible. Not to decide for them. Ever. So where does that leave us with Minimum Viable Product? How could organizing the project in a way that you could go live during the project be wrong? Well, what if going live early has no value to the client? In the diagram above, what if the client definition of value is only realized by being able to transport a family of 5? Being able to structure a project to continue to deliver Minimum Viable Products comes with a cost. If you look at the example above, you can see that so each step up in the viable product chain, we need to swap out some frameworks and functionality for other frameworks and functionality. Structuring a project in this way doesn’t come without a cost. Now there are many great technical reasons why to want to structure a project focusing on a chain of Minimum Viable Products. They help to address risk and provide lessons learned to improve the product and project as you go along. But don’t assume that it is always what the client wants, needs, or values. In exceptional circumstances, the extra effort to structure a project focusing on Minimum Viable Product may actually be most wasteful that structuring the project in a traditional way. There might be a series of Minimum Viable Products that could be created to address technical risk, but not to provide any early client value. Perhaps it might be just one prototype early on to address new technology. The important thing is don’t assume it has value for the client. We must always remind ourselves that the processes and methods we use must return more value for the client than other options and not just fall into the habit of executing every project using all the Agile tools in the tool belt. After all, isn’t that what got us in the Detailed Work Breakdown Structure, Big Design Up Front mess before? I was taking my Advanced System Analysis course and the final chapter was on CASE tools. If you want a refresher, the wikipedia page is actually quite good. I remember at that time in the late 80’s there was major discussion/movement on code generation and CASE tools. I guess it was the professions response to all the challenges with Software Development at that time. We had challenges completing projects successfully and within our estimates, so the CASE tools were going to ride to the rescue and generate all the code once we got all the requirements specified. In that way we would remove all the challenges and problems with the troublesome development activities. Which I guess were identified as the problem. If anything, this was the last gasp of the big requirements up front movement. If anything, these CASE tools required even more detailed requirements up front than were required before. A proliferation of modeling tools arose out of this movement to greater and lesser degrees of success. But thankfully none of these tools really provided an answer to the problems. In my limited use of CASE tools, I was amazed with the amount of work required to define the requirements to be able to generate code. And then it seemed that unless the code was totally mundane, there would always be issues with the code. And don’t get me started on the performance of the code. What I thought was interesting was that I saw two solutions arise out of the CASE rubble. 1) Off-Shoring – In the spirit of sub-optimization, this solution followed in line. If we can’t design tools to generate the code automatically, lets figure out a way to ship the code creation to the cheapest possible resources. In many ways, this was a solution in-line with the principles of CASE. We need to create a detailed specification document that we can then take and generate code from, either by algorithm or people. What I find most interesting is when I look back, the CASE movement was all about trying to solve a problem with more and more technology. Which we know hardly ever works. Now there is additional technology that makes Agile solutions possible, but at its heart it is a system with less technology not more. It is about communicating and working together to solve a business problem. Whether we be business people, analysts, developers, or yes, even project managers. If I only had the foresight back them to buy stock in 3M for all the stickies that the industry would successfully use over the next decades, I would be a rich man. Rest in Peace CASE, Long Live Agile. On the surface, these comments may seem to be contradictory. I seem to be supporting neither traditional or Agile. And I would agree that it can appear in this way. But like most good solutions, the optimal solution is a compromise between extremes. My intent of both posts was to communicate my thoughts on the fact that some level of planning is crucial. But when do you know when the plan is good enough? When is it excessive? I must admit I was someone who used to create detailed work breakdown structures. I even used to assign multiple people to one deliverable and have multiple items in progress. Looking back now I see that this was excessive planning for little value. The detailed project plan was also not an accurate depiction of how the actual project would execute. But as I stated in my prior posts, the creation of a temporal plan is critical to allow the team to think through the project process, dependencies, and possible conflicts. To start to do the project using just Flow may not allow you to fail fast. You may discover a dependency or conflict late in the process. It is possible that an initial plan would have highlighted this issue. But creating a project plan at the start can create assumptions and issues all on its own. So what to do? It the game of golf, there is a wonderful concept of a provisional ball. In the case where you have already launched a ball into the woods, you hit a provisional in case you cannot find the ball. It is seen as a time-saver to keep the game moving. I use this analogy when I create my high-level project plans. It sets the expectations with the clients that the plan will change, but that we have at least thought through one way that the project could be delivered. We then use flow to prioritize the next group of stories in the project. Once they are prioritized we use flow to execute. In my experience, these Provisional Project Plans provide the right level of planning. They allow the team to think through the execution of the project without committing to ‘the’ plan. It also then provides the ability to execute in a flow-based structure within the Provisional Project Plan.